NEW YORK, New York, February 15, 2013 (ENS) – In his final State of the City address, New York Mayor Michael Bloomberg proposed to add 10,000 public parking spots for electric vehicles over the next seven years. The proposal would require that 20 percent of all new public parking spaces in private developments built between now and the end of the decade be wired and ready for electric vehicles. To make that plan a reality, “We’ll work with the City Council to amend the Building Code,” said the mayor on Thursday in his State of the City speech. Zoning laws in New York require the construction of new parking spaces along with new building construction, usually in parking garages under or beside new buildings. According to the mayor’s office, about 10,000 new parking spaces are added each year in this way. The City now has 100 public EV charging stations and 120 for the city’s own fleet of electric vehicles. Under Mayor Bloomberg’s proposal 30 additional government stations would be installed this year. At two stations, the City will test the city’s first “quick chargers,” that will allow drivers to top up their batteries in as little as 30 minutes as opposed to the normal eight hours, said Bloomberg. One of the stations would be in Seward Park, a complex of apartment buildings and a park on Manhattan’s Lower East Side. The second station, for electric taxis, will be located at the headquarters building of the electric utility ConEdison. Hailing a cab in New York could mean climbing into an electric cab this year as the city places the first six electric Nissan Leaf taxis on the road. Nissan North America, Inc. and New York City will be piloting six Nissan Leaf electric vehicles beginning this spring. These cars will be put into normal taxi service and will enable Nissan, the City, the taxi industry and the public to learn more about how electric vehicles work as taxis. Currently, New York has over 3,800 hybrid taxis and other clean diesel vehicles, representing almost 29 percent of New York’s 13,237 taxis in service, the most in any city in North America. 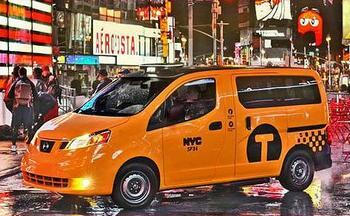 Mayor Bloomberg said his goal is to make one-third of the City’s taxi fleet electric by 2020. The mayor also proposed to add 50 more electric vehicles to the city’s own fleet of 458 plug-in electric cars. It’s the third largest EV fleet in the United States after the federal government and the corporation General Electric. New York State Department of Motor Vehicles data show that as of December 2012, there were 2,069 electric vehicles registered in the five boroughs of New York City. Later this year New York will introduce a bicycle-sharing system.